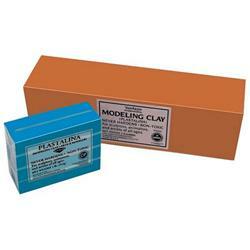 Van Aken Plastalina (modeling clay) is a pigmented oil base modeling compound renowned throughout the world for its smooth consistency and brilliant color range. The range includes eight spectral hues, seven neutral tones, five earth tones, and four pastels. Twenty four colors in all. Colors are readily intermixable with ivory and white to obtain tints, with black for shades, and with each other to achieve intermediate hues. Van Aken Plastalina can be easily modeled by hand, with Van Aken double ended tools for fine detail, and in certain production applications requiring multiple reproductions, the product may be melted (150° F/65.5°C) and poured into a mold. Preferred by sculptors, model makers, clay animators and artists of all ages, Van Aken Plastalina is self adhering, non-toxic, never hardens, remains pliable and plastic, can be used time and time again. In fact, like a fine wine or cheese, its consistency improves with age.